Growing up on the Monterey Peninsula, Eric Hamacher’s love of wine developed early while working in a number of great restaurants. Originally eric’s sights were set on the straightforward world of medicine. that goal was eventually replaced with the less obvious, but more fun world of wine. In true form, once his passion was REALIZED he pursued the education and experience to master the art. In 1988, Shortly after graduating from the prestigious UC Davis Enology program with a degree in Fermentation Sciences, He set forth as a winemaking gypsy. Eric spent the next 7 years traveling the world following harvests, eventually landing jobs in California with Mondavi, Chalone and Etude. Ultimately, the pull for pinot was too great and Eric headed North in 1995 to the “Promise Land” of Pinot Noir and founded his eponymous winery in the Willamette Valley. After pushing for several years and finally succeeding to change Oregon state law to enable multiple winery licensing in one facility, Eric with his wife, Luisa Ponzi and partners Ned and Kirsten Lumpkin co-founded The Carlton Winemakers Studio in 2002. The studio was the first of its kind and operated as a multi-winery facility designed to enable small, high-end wineries and BOUTIQUE, artisanal producers to share space and expertise. 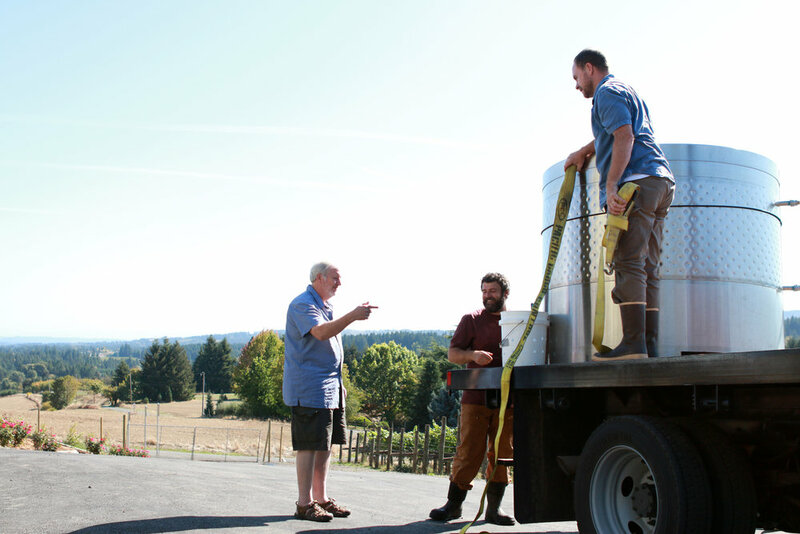 Steve Hendricks and Andrew Kirkland of Ruby Vineyard & Winery receiving fermentation tanks from Eric Hamacher during Harvest 2016. Eric has been the winemaking consultant for Ruby since 2015. With the bountiful 2014 harvest and the seams stretching at the Studio, Eric moved himself out. With the “reopening” of Hamacher wines at the original Ponzi Historic Estate, Eric was able to open his first tasting room, dedicated to showcasing his wines directly to grateful wine lovers. Today, Eric’s production of Hamacher Wines is Just shy of 2,000 cases annually, possible Oregon’s slowest growing winery! Eric is also the winemaker for Ghost Hill Cellars and works as consulting winemaker for various other brands. With his focus and dedication to old vines and small lots and due to his uncompromising commitment to quality, Eric hamacher has become one of the most respected and sought-after wine producers in the region.